Why have your flagship model fight for attention at the year's first major auto show? Many writers in the auto industry were left scratching their heads when the 2018 Ford Mustang made its debut a week after the press days at the 2017 Detroit Auto Show had wrapped. Not every outlet cared, although some were made very upset by the move. After we finished salivating over the revised Mustang the CarBuzz office began to question the move as well. After some back and forth the conclusion we reached was that it made perfect sense for Ford to skip the show and debut the new Mustang on its own terms. As amazing as the Kia Stinger is a South Korean sports sedan would not have outshone America’s most beloved muscle car at any auto show, least of all Detroit. But why share the spotlight when you can bathe in it alone? While the new Mustang would have been the king of Detroit it still would have had to share a portion of the spotlight with the Stinger and all the other production cars and concepts on the show floor. Those include the new Toyota Camry, Honda Odyssey, Lexus LS 500 and Mercedes-AMG GT C Coupe. Concepts that attracted a ton of attention include the Nissan Vmotion 2.0, Audi Q8 and Volkswagen Buzz I.D. The Rock revealing that injured US military veteran Marlene Rodriguez would be receiving a 2018 Ford Mustang in honor of her service and sacrifice would have blown the roof off the Detroit Auto Show. Still, the Blue Oval would have had to cram that event into its press conference, which again, happened during a very busy news day in the auto industry. 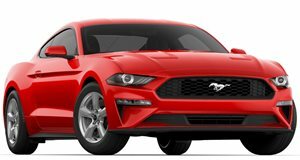 By waiting a week the automaker ensured that the new Mustang’s reveal was not only the top automotive news story but also one of the top stories nationally. Thanks to the Internet and social media a car company doesn’t need to assemble journalists inside a convention center to create buzz for its newest model.